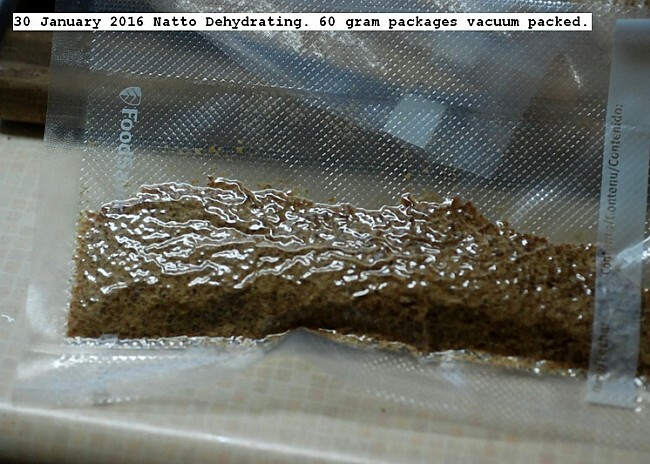 A package, 673 grams,of previously fermented Natto was dehydrated at 115/46C, blended into a powder, and vacuum packed in 60 liter plastic bags. Sixty liters or two tablespoons being a reasonable serving. Apparently the temperature chosen does not destroy nutrients. The powdered Natto may be reconstituted in a liquid and ingested or used for a soup base. It should keep almost indefinitely at room temperature. This entry was posted in Uncategorized and tagged 30 January 2016 Natto Dehydrating, Natto Dehydrating. Bookmark the permalink.